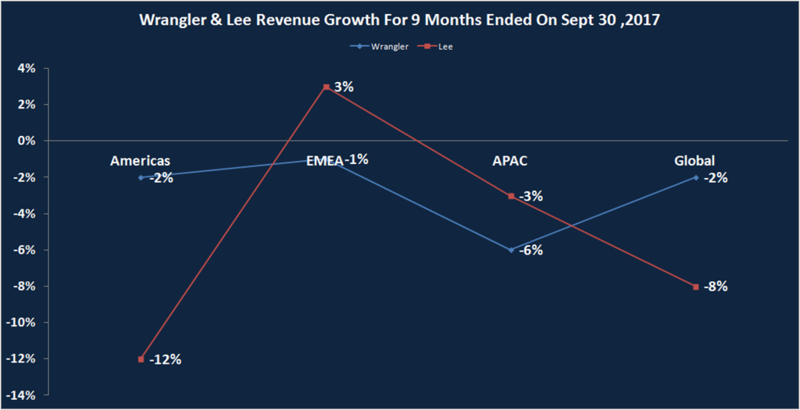 Third quarter revenue from continuing operations increased by 5 percent to $3.5 billion. Outdoor & Action Sports revenue increased by 8 percent. 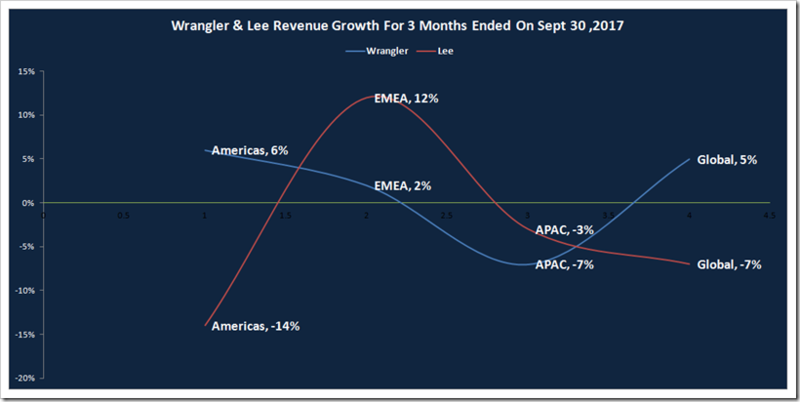 International revenue increased by 13 percent , including 18 percent growth in Europe and 9 percent growth in China. Direct-to-consumer revenue increased by 18 percent. 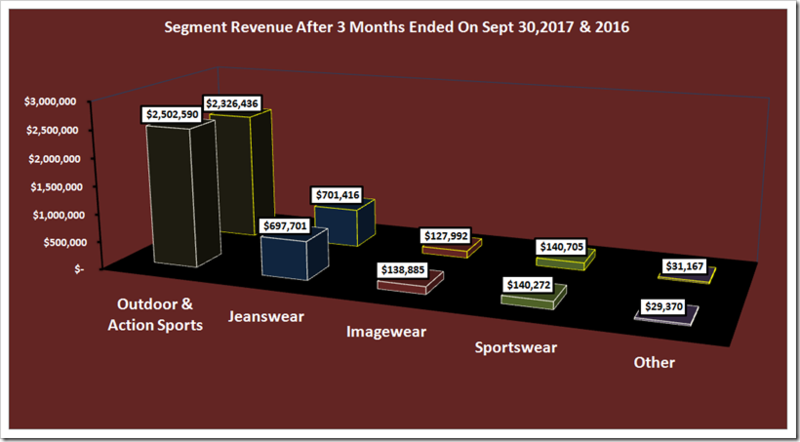 Though there is an increase of 5% in total revenue for this quarter ended on Sept 30 , 2017 , but going into deep we found that the Jeanswear is loosing its revenue by 1% after comparing the figures of the last year for the same quarter. 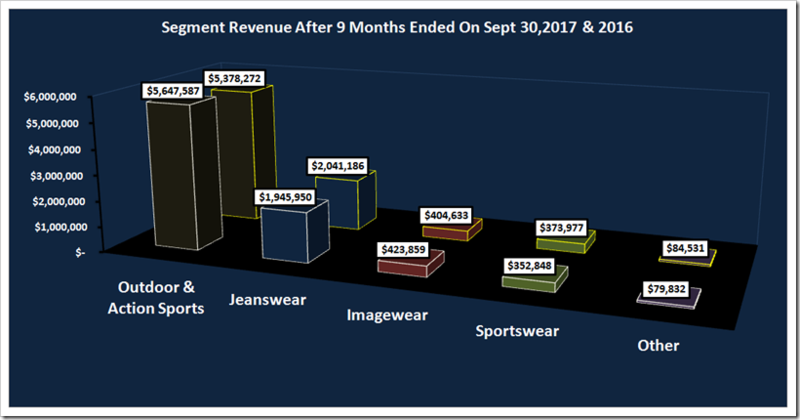 Sportswear has nil growth in terms of revenue and the uncategorized segment ( Other) has declined by 6% in this quarter. 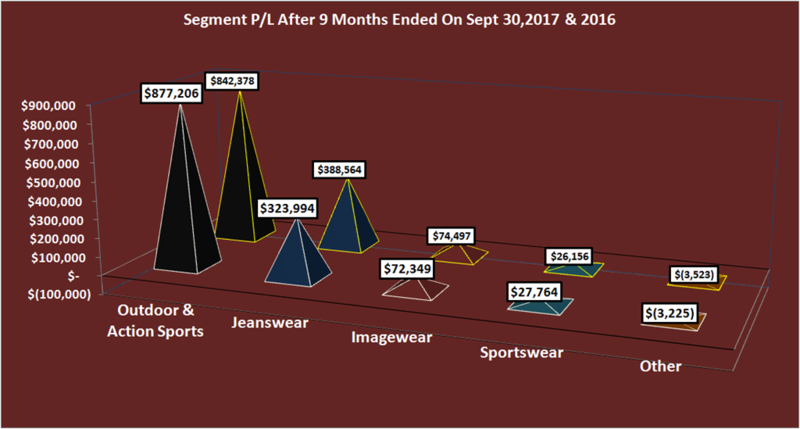 Imagewear and Outdoor & Action Sports are the two biggest gainer in this quarter with 9 % and 8% growth in their revenue respectively . Outdoor & Action Sports is the biggest contributor in the revenue with 71% share in the total however Jeanswear contributes only 20 % . With the summation of the revenue of 9 months of this year ended on Sept 30 , 2017 , we noticed the overall growth of revenue is 2% . 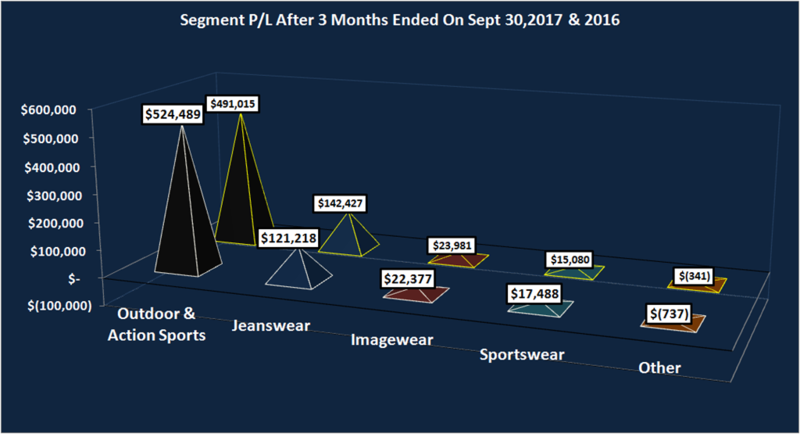 Outdoor & Action Sports and Imagewear marked a positive change of 5% in the revenue however the rest segments including Jeanswear and Sportswear are on adverse growth . 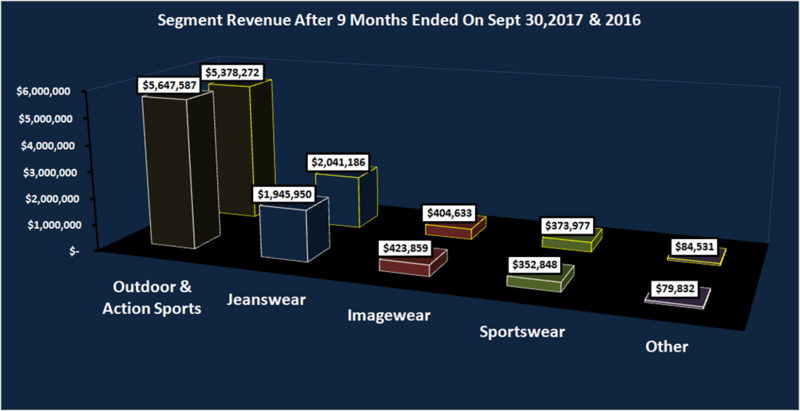 Jeanswear reduced by 5% while the revenue of Sportswear by 6% . 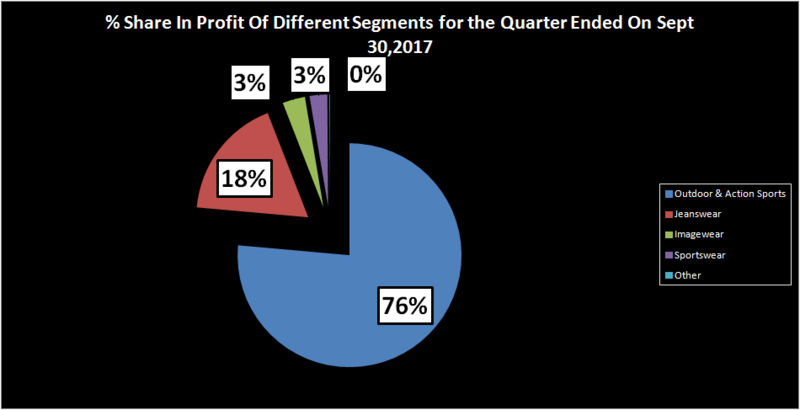 While there is a growth of 5% in revenue , the profit has been increased by 2% only for the quarter ended on Sept. 30 ,2017. 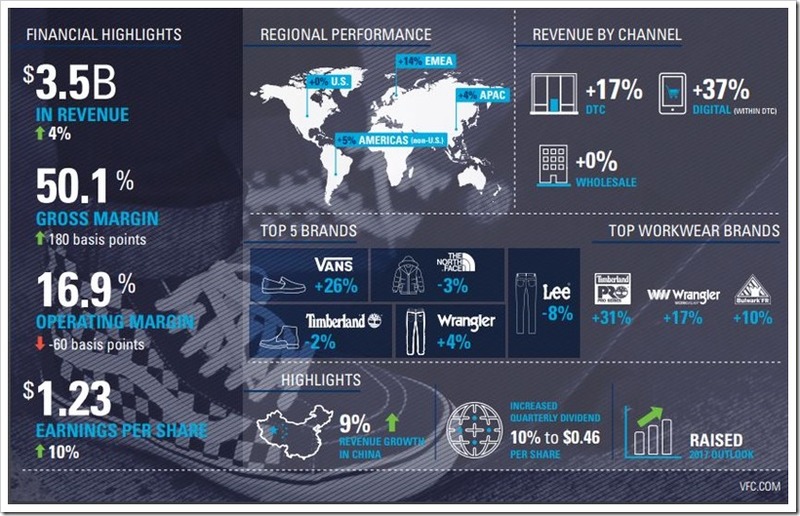 Out of the total profit of USD 684 million 76% has been contributed by Outdoor & Action Sports and 18% by Jeanswear . 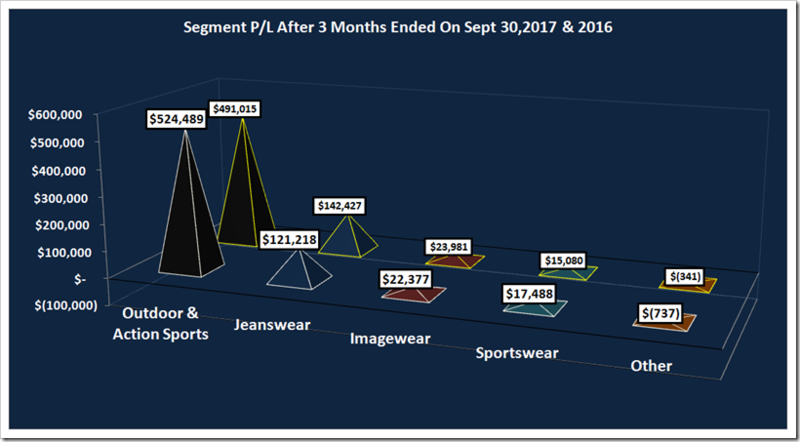 Jeanswear’s profit has been reduced by 15% in this quarter however the uncategorized segment lost by 116 % . 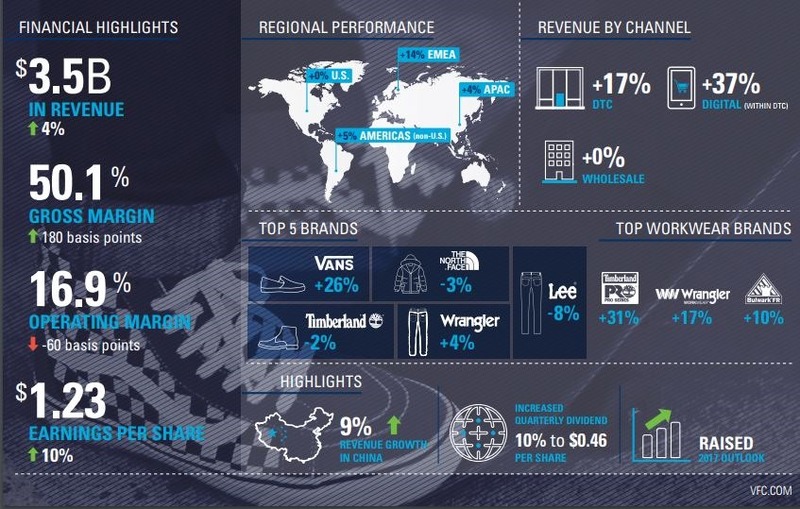 Sportswear is the biggest gainer in this quarter with 16% rise in profit . Outdoor & Action Sports increased by 7% this quarter . While analysing the profit for 9 months , we noticed the reduction in profit by 2 % . 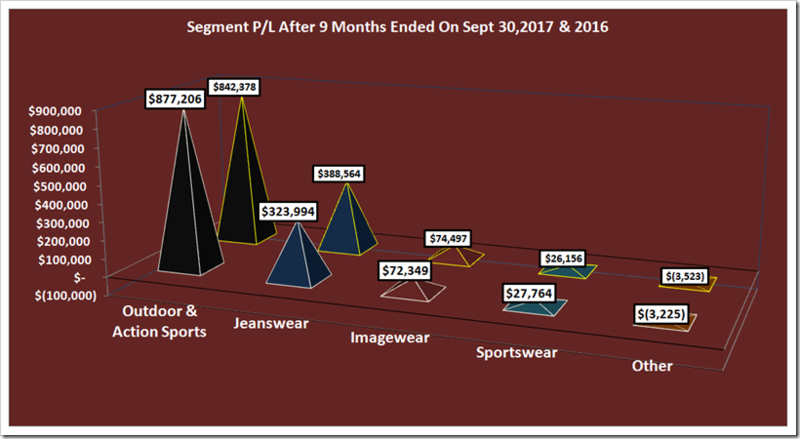 Jeanswear lost the profit by 17 % while there is a rise of 6% in profit for Sportswear. 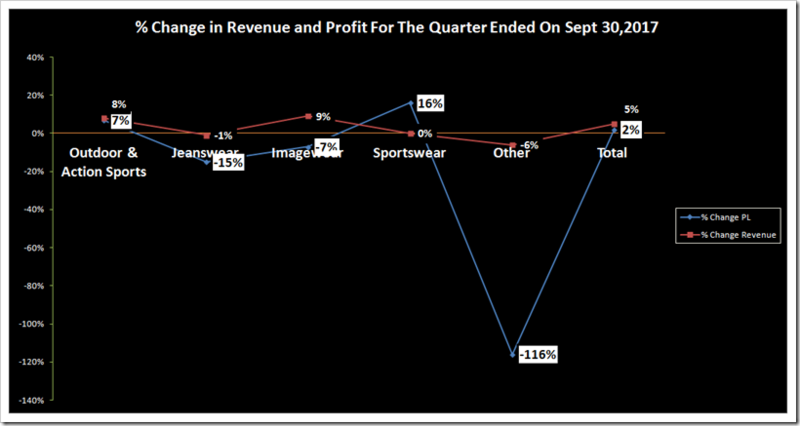 Outdoor and Action Sports registered a fairly reasonable growth in the profit of 4% while Imagewear is on declining side with adverse growth of 3%. 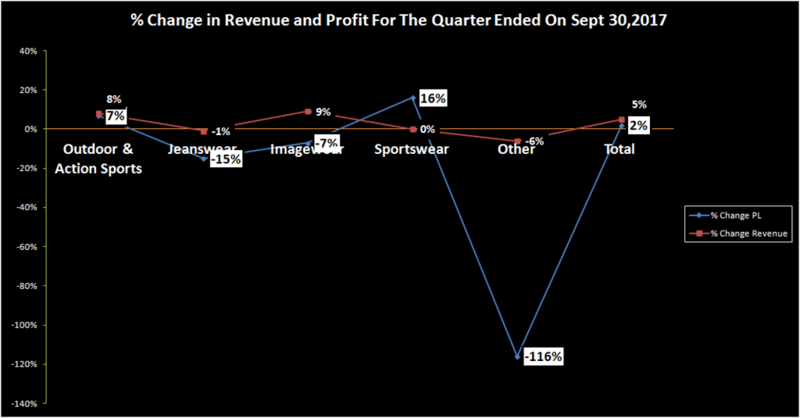 Sportswear has 0% change in revenue however this segment has managed to register a growth of 16% in the profit . 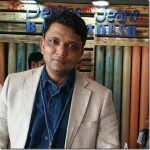 The uncategorized segment ( Other) has registered an adverse growth of merely 6% however there is an adverse growth of 116% in profit .The same happened with Jeanswear as well , its revenue lost by 1% however the corresponding segment lost its profit by 15% . Revenue is now expected to increase about 6 percent on a reported basis to approximately $12.1 billion. This compares to the previous expectation of $11.85 billion, a 3.5 percent increase on a reported basis . Both estimates include about a $200 million contribution from the previously announced Williamson-Dickie acquisition. 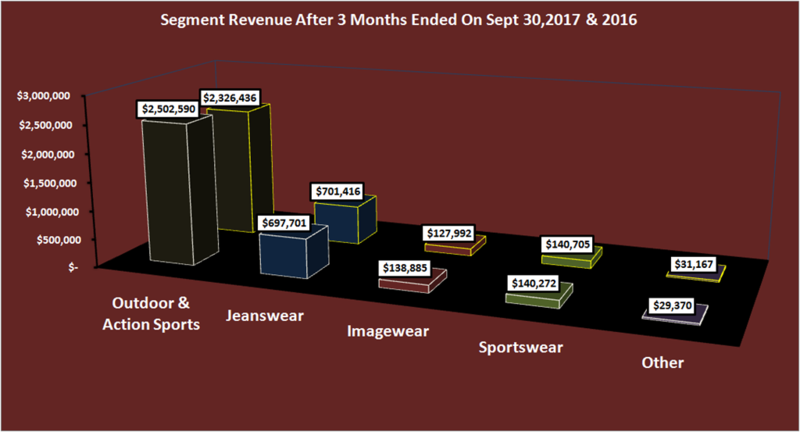 By coalition, revenue for Outdoor & Action Sports is now expected to increase approximately 7 percent versus the previous expectation of an approximate 5 percent increase ; revenue for Jeanswear is now expected to decline slightly versus the previous expectation of revenue that approximated that of 2016; Imagewear revenue is still expected to increase at a mid-single-digit percentage rate; and, Sportswear is still expected to decline at a high single-digit percentage rate. 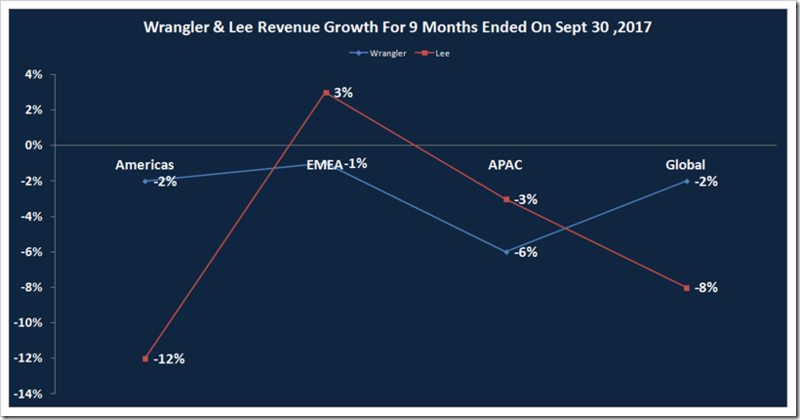 International revenue is now expected to increase approximately 10 percent versus the previous expectation of a low single-digit increase . Direct-to-consumer revenue is now expected to increase approximately 13 percent versus the previous expectation of a 10 percent to 11 percent increase. VF Corporation outfits consumers around the world with its diverse portfolio of iconic lifestyle brands, including Vans®, The North Face®, Timberland®, Wrangler® and Lee®. Founded in 1899, VF is one of the world’s largest apparel, footwear and accessories companies with socially and environmentally responsible operations spanning numerous geographies, product categories and distribution channels. VF is committed to delivering innovative products to consumers and creating long-term value for its customers and shareholders. For more information, visit www.vfc.com. 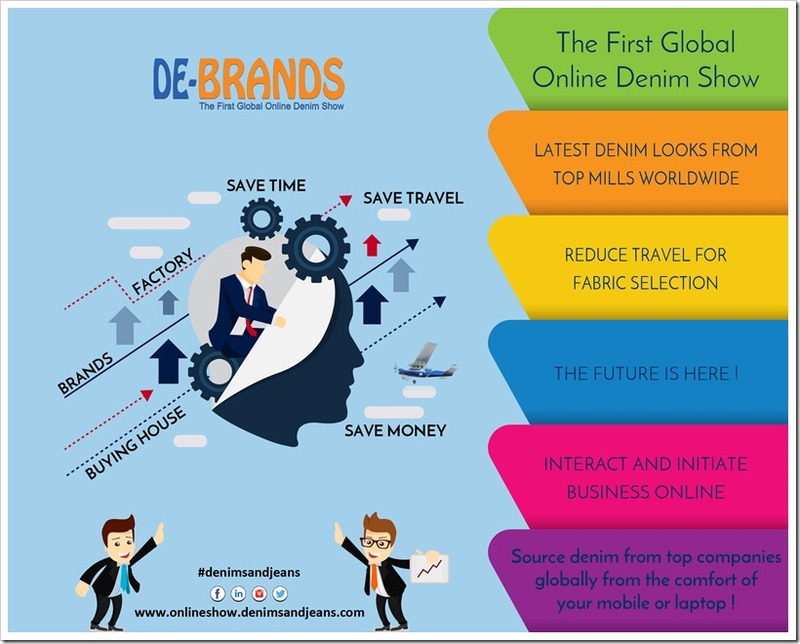 Check the World’s First Virtual B2B Platform for Denim Buyers and Suppliers . To visit , please click here.